‘Ohana Lodge is a rare find! 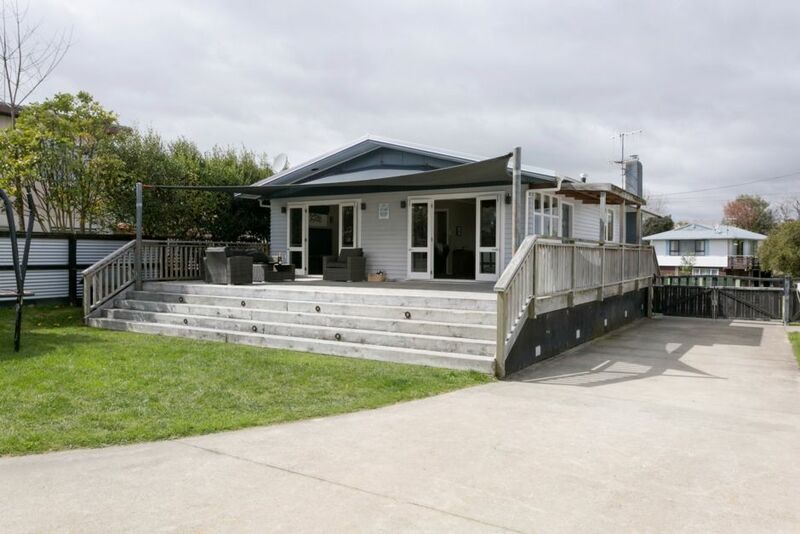 You've stumbled upon a wonderful modern and pet friendly holiday home in beautiful Lake Taupo. With free unlimited WiFi, skate ramp, basketball hoop, large grassed area, books and toys, the kids will be in heaven. With the private, fully fenced section, large deck, BBQ and outdoor furniture with large shade sail, you can relax and unwind with a beer or wine while the kids play. Please note the trampoline is damaged and not to be used. PET FRIENDLY INSIDE AND OUT! ‘Ohana Lodge boasts an entertainers kitchen, big sofa with four recliners, heat pump/air conditioning unit, huge 60 inch TV with MySky and Playstation. Only a few minutes drive from the lake front and town, ‘Ohana Lodge offers an escape with all the creature comforts of home. ‘Ohana Lodge is fully equipped with all the essentials to make you feel like you are ‘home away from home’. Modern appliances, induction microwave and brand new oven. ‘Ohana Lodge has three bedrooms, open plan living area and kitchen that open onto a stunning deck with BBQ and outdoor furniture. Luxurious bathroom features a large deep bath and double headed shower. Pets welcome. The whole house is available for your use during your stay including half of the garage which contains the laundry (washing machine and sensor dryer). There is a work bench and lots of space available if you need it for any tools or equipment. Clothes airer, washing basket, etc all available for use. We have a secure place for you to collect keys and will give you a personal alarm code so you will be fully self sufficient. Lake Taupo is “New Zealand’s Ultimate Playground” and boasts an array of fabulous activities such as trout fishing, golf, jet boating, bungy jumping, sky diving, mountain biking, parasailing, snow skiing and all the water sports you can think of. 7 guests total can stay if there are 3 kids in the bunks or an infant in the portacot. Smoking outside only. Please dispose of butts carefully and thoroughly. Please be considerate and courteous to the neighbours. Property and house to be left in a clean and tidy manner for bond to be released. PET FRIENDLY INSIDE AND OUT Many properties boast that they are pet friendly but then only allow small dogs and/or do not allow them inside. At Ohana Lodge, pets are welcome inside too 5 minutes from Lake and Town TAUPO is beautiful all year round and there is something for everyone. Lovely large bathroom with toilet, shower and bath. The shower is huge with twin heads and there is a heater and skylight to keep the room as warm or as cool as you like. Powerful Heat Pump / Air Conditioning unit in lounge. All linen provided, sheets, pillow cases, duvet, blankets, etc. Double dish drawers make keeping the kitchen clean a breeze. Automatic ice maker in the fridge. Just fill the container in the fridge and ice appears magically in the freezer! Modern new multi fan oven. Separate ceramic hobb / cook top. Tea, coffee, milo, raw sugar, white sugar, flour and cornflakes provided. Salt, pepper, cooking oil available. Lovely large designer kitchen with all the modern amenities. Three breakfast bar stools are great with kids or when entertaining. Lovely huge middle island and loads of bench space. Large 60 inch TV in the lounge, TV in the Master and Queen. Sky TV, Netflix free of charge. DVDs can be played through the Playstation. Large range of books for all ages and interests. A large range of family games available including cards, board games, etc. Small selection of childrens toys available. Extensive selection of DVDs available for all ages. Nice property, clean, tidy & fairly close to town. Would highly recommend. Master room most comfortable bed?? Because of the toilet being in bathroom maybe need a mirror in bedroom would help. Great modern property to rent.